« How about a yurt? 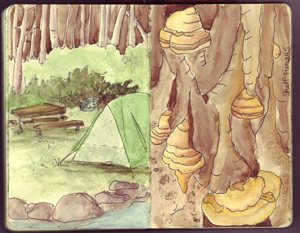 Under the watchful eyes of the forest, and the “fun guys” who make the woods their home, it’s so nice to have a cozy tent waiting for you at the end of your wanderings in the Park. When I canoe, I like to have a tent that accommodates twice the recommended capacity. When there are two of us, I always lobby for a four-man tent! There’s nothing like having the space to sit up, hang the lantern, and play a game of cards when the rain is falling outside.